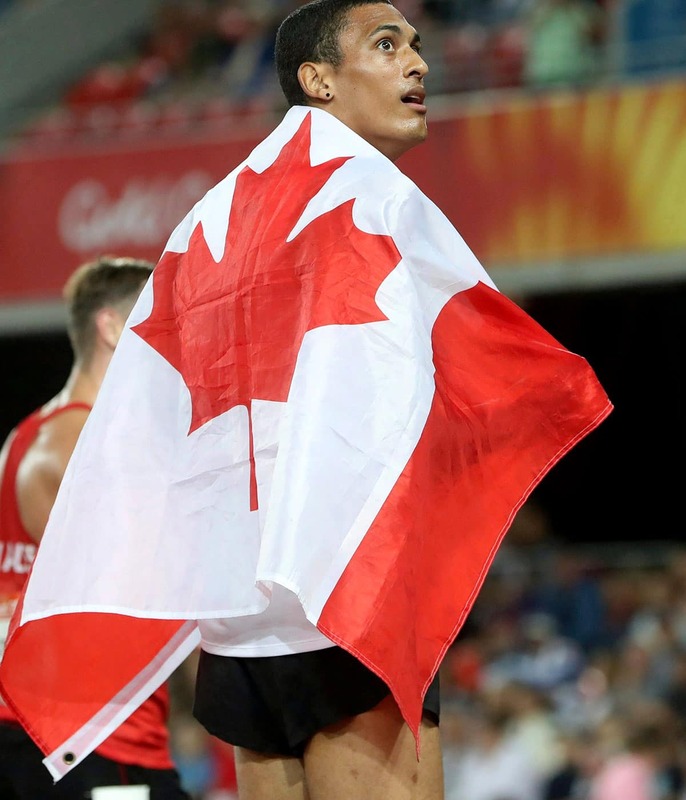 When I got back to my room inside the Athletes’ Village after winning the silver medal in the Commonwealth Games men’s decathlon in April, it was 1 a.m. and I was so tired. I took the medal that had been hanging around my neck, put it in a drawer and went to bed. For the rest of the Games, I only took the medal out of that drawer once, for an interview I was doing. I never looked at it because I was already looking forward to what was next for me. . . Gotzis (the Austrian town that’s home to the most famous multi-events competition in the world), the 2019 world championships, and the 2020 Olympics. The Commonwealths were my first official Canadian senior national team competition. Going into it, I had an idea that there was potential for me to get a medal. You take the decathlon event by event, and by the time the competition got to the pole vault — the eighth of 10 events — I told myself, “I can do this.” I cleared a personal best in that event. I was happy, but I was also thinking that this wasn’t my ideal result. I could have run faster, I could have done this, I could have done that. Usually my mom deals with all of the decorating around the medals and ribbons that I’ve won, but the Commonwealth medal is a little different. I wanted to keep that one in my room. My mom is a big part of my tight-knit circle of support and I’m very thankful for the people around me. When I was younger, I never took into consideration what my parents were doing for me, but today I appreciate everything they’ve done and understand the sacrifices they made. My dad works in downtown Toronto and my mom is a stay-at-home babysitter. When I first started training at York University, my mom drove me there three times a week from Whitby, Ont. She’d sit there for hours while I trained. My coach, Greg Portnoy, is like a father figure to me because we spend so much time together. I was 12 when I met Greg. We were introduced by Kevin Sunjari, who was my triple jump coach in Whitby. Back then, Greg told me I was too young to train with him, so I spent most of my time playing video games. That all changed when I was 17 and going into Grade 12. That’s when I started training with him. Greg and I set goals every year, laying out plans from September to September, because that’s how the track and field calendar works. Three years ago was my first year of senior competition and the goal was to hit 7,400 points. After Day 1 of the combined event at Nationals I had 4,400 points, and I was on pace to meet the Olympic standard. I shocked myself, but then ended up no-heighting in pole vault. That competition was a game changer for me. Two weeks later I scored 7,900 points and then in France that February, I hit 8,000 points. My mindset suddenly changed…I thought “huh, maybe I’m better than I think.” My whole work ethic and discipline changed. Before that, I was a kid. Now I was totally into it. It was time to take decathlon seriously. Damian Warner has been a great role model, helping me make the transition from just being a pretty good local athlete to competing against the best in the world. I see how he carries himself, I see his composure. We don’t meet in person very often because we train in different places, but we talk and he gives me advice. It’s fun to not be the only person of your nationality in the decathlon, and it’s nice having someone willing to help you at events like the Commonwealth Games and Gotzis. People call me baby long legs because of my height - I am 6-7. And some of them have said “He’s the next Damian Warner.” That’s awesome — hopefully I can be as good as Damian. When Damian retires, I hope I can lead by example too. My parents have five children — I’m smack dab in the middle — and they have gone overboard with their support for me. I don’t want them to do that anymore. I’ve been lucky to have some funding because I’m travelling now, I have to buy vaulting poles at $1,000 apiece, and I need shoes for the different events of the decathlon. Without financial support, I couldn’t be anywhere near as successful as I’ve been. I’m in a fortunate position, and I have to thank the Canadian Olympic Foundation for helping me. I know that their new fund matching program, 5to8.ca, will help other next generation athletes. That’s 5to8, as in five to eight years away from a podium, by the way. I was also an RBC training ground winner too, which helps. If it wasn’t for the financial help, there are many athletes who would have had to quit. As a parent, you don’t want to have to make that choice. Who knows? Your kid could be the next Wayne Gretzky. Every mom and dad want to do what they can to make their child’s dreams come true. Don’t wake me up. I’m getting there.